featured Jimmy Martin & The Sunny Mountain Boys! Wristbands included two outstanding days of bluegrass bands! The concert will began on Friday at 4 PM until 10 PM, and we did it again on Saturday from 3 PM until 10 PM. It was held in the air-conditioned Recreation Building, and will feature several premier bands. Wristbands were for both days in addition to your site fee. Many guests made reservations for Thursday, August 21st (to participate in the fun) and departed on Sunday, August 24th.Call Ocean Lakes, for campsite reservations dial toll free, 1-877-510-1314, for rental reservations dial 1-800-845-2229. This show is exclusively for Ocean Lakes’ guests (campers, renters and Annual Lease holders) – there are no wristbands for the general public. Seating is limited. When you call to make your reservation, let us know you are coming to hear bluegrass and we’ll take care of the rest! Jimmy Martin and The Sunny Mountain Boys – Born as James Henry Martin, 10 August 1927, Jimmy Martin, MCA Recording Star and known as “The King of Bluegrass” and “Mr. Good ‘N Country” was born in Hancock County, Sneedville, Tennessee. His lifelong dream came true when he joined Bill Monroe in 1949 as lead singer and emcee. Jimmy worked with Bill Monroe for five years, helping him write and record such high lonesome classics as “Uncle Pen,” “The Little Girl and the Dreadful Snake,” and “I’ll Meet You in Church Sunday Morning (which Jimmy actually sang tenor to Bill’s lead)”. Many rate Martin to be the finest lead singer and guitarist ever to work with Monroe. He played on some of Monroe’s best recordings and sang notable duets with him, including “Memories Of Mother And Dad”. In 1953, he was joined by Bob and Sonny Osborne. Jimmy Martin and the Osborne Brothers performed and recorded now classic songs such as “She’s a Cute Thing,” “That’s How I Can Count on You,” “Chalk up Another One,” and “Save it!, Save it!” Finally he formed his own band known as the Sunny Mountain Boys. Jimmy and his group appeared as regulars on the WJR Barn Dance in Detroit, Michigan for several years. It was then in 1956 when he signed a long term contract for Decca Records (now known as MCA). With the Sunny Mountain Boys, Jimmy recorded many wonderful sides, such as “Sunny Side of the Mountain,” “Hit Parade of Love,” “20/20 Vision,” and “Freeborn Man.” In the 1950’s and 60’s, Jimmy’s recordings frequently made the country music charts in Billboard, Cash Box, and Record World magazines. His band has contained some great bluegrass musicians, including J.D. Crowe, Doyle Lawson and Alan Munde. He recorded for Decca and had some chart successes including “Rock Hearts” (1958) and “Widow Maker” (1964). Upon leaving Detroit, Jimmy went to Shreveport, Louisiana as a headline attraction on the highly rated Louisiana Hayride for 3 years. Other artists who were members of the Hayride include Johnny Horton, Hank Williams, and even Elvis Presley. Jimmy Martin was one of the biggest draws and the highest paid entertainer as a regular member of the Louisiana Hayride and again at the WWVA Wheeling Jamboree, which he joined in 1960. He moved to Music City USA in 1963 and made numerous guest appearances on the Grand Ole Opry. His home today is in beautiful Hermitage, Tennessee, not far from the historic home of President Andrew Jackson. He also achieved acclaim for his work on the Nitty Gritty Dirt Band’s legendary 1972 album Will The Circle Be Unbroken. Many experts believe that Martin has never been afforded full credit for his contributions over the years. It may be that his frankness and the perfection that he expects from his musicians have at times worked against him. David Nance, affectionately known as “Sweets,” hails from North Carolina and has been a Sunny Mt. Boy longer than any other. He began his career with Jimmy in Northeast, Maryland in 1987. David is Jimmy’s right hand man, playing dobro, amd singing tenor and lead with Jimmy. He also helps drive the bus when needed. David resides in North Carolina with his beautiful wife, Gail, and their two children, Jordan and Chandler. David has released a project entitled “MY OWN SWEET TIME” which features Jimmy as an honored guest performing with him. Lou Reid & Carolina – Born on a tobacco farm in Moore Springs, NC, Lou Reid was surrounded by traditional music and took up the guitar at age seven. To this day, his music continues to mix the elements of bluegrass with the energy of rock and roll…offering a vibrant sound that still encompasses traditional values. As a musician, Lou Reid is revered for both his distinctive high tenor vocals and instrumental prowess. Lou was critical in bringing vocal harmonies to the forefront of contemporary bluegrass music as a founding member of Doyle Lawson and Quicksilver. He continued to earn acclaim with the Ricky Skaggs band. As lead singer and guitarist, he breathed new life into the already well-respected band the Seldom Scene (which he is still a full-time member as mandolinist). He recently became lead guitarist for the award-winning group, Longview, which plays select dates throughout the year. An able, if often overlooked, songwriter, Lou is the complete musician. With his band Carolina, Lou continues to further his reputation with his brand of driving North Carolina style music and stirring vocals. Raised in prime bluegrass country, Union Grove, NC, Christy Allen was around music from the very beginning. Her grandfather, Dewey F. Dowell, Sr. was National Fiddle Champion at the first Union Grove Fiddler’s Convention. Her parents enjoyed bluegrass music, frequently taking them to bluegrass events to see cousin Kent perform with the Country Gentleman. Along with Lois and Franklin, Christy joined cousins Andrea, Dirk, Jason and Darren to form the Grass Vibrations. The band was a favorite at local venues, and eventually recorded two projects together, much to the families delight. Playing and being around other groups soon led to Christy joining Mike Allen’s band, 220 Connection. The group was very successful at local conventions, and soon set their sites on the Pizza Hut Showdown contests. As the group Southern Drive, they went on to win the 2000 International Pizza Hut Showdown in Louisville, KY. It was soon after that former bandmate in 220 Connection and Southern Drive, Kevin Richardson, contacted her to try out for the new configuration of internationally known band Carolina. Kevin Richardson was introduced to bluegrass music at a very young age. His father, Steve Richardson, and mother Sharon, took Kevin to bluegrass festivals as a toddler. Kevin’s earliest childhood memories revolve around his Dad’s music. Steve played the mandolin. When Kevin was seven, Steve gave him a guitar and a years worth of lessons with it. He began playing in a band situation when he was just 10 years old, along with his dad and other family members. They enjoyed playing at family parties and local fiddler’s conventions. His breaks were soon winning blue ribbons and attracting a lot of attention on the convention circuit. At the age of twelve he played his first jam with a banjo player from Mocksville, NC. He turned out to be Kevin’s future band mate for more than seven years, Mike Allen. A year after their first jam, Mike joined Kevin, his father, and C.H. Lineberry in their band, 220 Connection. They traveled all over North Carolina and Virginia playing fiddler’s conventions and having a ball. While still playing with 220 Connection, Kevin got a job offer to go play a summer festival tour with popular sister duo, The Shankman Twins. As their lead guitarist, he played festivals in Maine, New York, West Virginia, Texas, and Indiana. Soon 220 Connection set their sites on the Pizza Hut International Showdown title. Armed with a new band name, Southern Drive, and new band mates in Ashby Frank and Greg Martin, Kevin, Christy and Mike won the Showdown for the year 2000. It was soon that Kevin found himself in a jam situation with one of his favorite bluegrass musicians, Lou Reid. It was here that a friendship began between Kevin and Lou. Soon Kevin was calling Christy, and the rest, is history. Joe Hannabach has been playing bluegrass since he was a kid back in the Ozark Mountains of Arkansas in the early 1970’s. Some guy left his bass at his house for a few weeks and Joe found out that it was easier to play than the fiddle. His family band was never the same afterwards. Joe comes to Lou Reid and Carolina with lots of bluegrass band experience. Joe’s been a part of a serious dawg music band, recorded with a couple of regional, short-lived bluegrass bands, and has been in some very high placing, “throw together” Galax and other contest bands. Born in Pulaski, VA in 1983, Joey Cox grew up listening to bluegrass music with his family. As far back as he can remember, he always had some old beat up guitar or banjo to pluck on. It wasn’t until he turned 10 that he started playing guitar seriously with his grand-pa’s band, The Black Mountain Ramblers. Two years later, he picked up the banjo, and he was hooked. After placing at many local competitions, he joined the Hillsville based group, Fast Forward. It was then that he learned about back-up, lead-in’s and band dynamics. Joey has also played with his friends Patrick Robertson (guitar), Jason Robertson (mandolin), and Barry Collins (bass) in a band called Canyon River. He has enjoyed playing with them and looks forward to more picking in the future! Joey’s excited to have joined Lou Reid and Carolina, and looks forward to this year especially and to the many opportunities it brings. See more at www.loureidandcarolina.com. Ronnie Reno & The Reno Tradition – Ronnie Reno, the eldest son of the legendary Don Reno, carries a tradition and legacy like no other act in Bluegrass Music, the “Reno” name. Ronnie started playing Mandolin and singing with his father’s band at the age of ten. History would acknowledge Don as the innovator of the three-finger roll on the five-string banjo. Ronnie, of course, had no idea that he would become part of musical history and truly a second generation bluegrass artist and innovator in his own right. Ronnie now looks back on that time as the solid foundation that has carried him throughout his career as a songwriter and performer. After ten years with Reno and Smiley, Ronnie was drawn to yet another legendary group, The Osborne Brothers. It was the sound of the harmony they created together that inspired Ronnie to stay with the group for five years. While The Osborne Brothers were touring as an opening act for Merle Haggard, Ronnie’s vocal talents came to Merle’s attention. Merle was so impressed with Ronnie’s vocals and the blend of their voices that he offered Ronnie a job as his opening act. It was so popular that Merle asked Ronnie to stay on stage during Merle’s set and harmonize with he and Bonnie Owens. This led to a nine-year relationship with the legendary Merle Haggard. Ronnie’s roots were still in Bluegrass and that’s what he longed to do. In the family tradition Ronnie called upon his younger brothers, reluctantly said goodbye to his good friend Merle and formed The Reno Brothers Band. From twenty years of playing with some of the musical greats in both Bluegrass and Country music, Ronnie’s experience led him to create his own unique sound. That, he realized, is what creates legends in any musical genre. For the next fifteen years, Ronnie Reno and the Reno Brothers toured together and played most of the major Bluegrass Venues and Festivals in the country. Now, Ronnie has taken another step in his musical journey. With the formation of Ronnie Reno and The Reno Tradition, Ronnie steps up to share the tradition and legacy set forth by he and his father in the early days of Bluegrass. To accomplish this, Ronnie has selected some of the finest musicians in bluegrass music in Danny Roberts, Heath Van Winkle, Jackie Miller and Mike Scott. The show is that musical journey. It takes you through the musical life of Ronnie, Don Reno, The Reno Brothers, and the legends that Ronnie has had the privilege to play and record with over the years. You’ll hear the original songs written and recorded by Ronnie, his father, and the songs and sounds Ronnie helped create throughout his career. The show is a high-energy presentation with tight harmonies, driving instrumentals and a stage presence that only years of entertaining can bring. It’s a wholesome family show that will leave your audience on the edge of their seats and calling for more. See more at www.ronniereno.com. The James King Band. From the moment you hear his voice, you know you’re hearing bluegrass the way it was meant to be sung. James King sings bluegrass as only a handful of others before him. Bluegrass Unlimited calls him the “most impressive lead vocalist to emerge in traditional bluegrass this decade.” Although James King was largely unknown until his smash 1993 Rounder debut, “These Old Pictures”, King has been around the music all of his entire life. He was born near the very heart of Bluegrass Country in the town of Martinsville, VA. After a stint in the Marines, King began to pursue his musical career in earnest in 1979. In the mid-1980s, King recorded tow albums along with Ralph Stanley and his band for Webco Records, “Stanley Brothers Classics” and “Reunion”, which were followed by his debut with his own band, 1988’s James King Sings “Cold, Cold World.” But it wasn’t until he decided to work on a project with Johnson Mountain Boys’ Vocalist Dudley Connell that he found his true voice, on what Bluegrass Unlimited dubbed “the breakthrough album of the year.” King’s startling power and emotional purity in his voice led to great revies, live performances from coast to coast, and a 1995 IBMA nomination for emerging Artist of the Year. James won the honor of being the 1997 IBMA Emerging Artist of the Year and the 1998 SPBGMA Traditional Male Vocalist of the Year. Kevin Prater was born in Grundy, Va. and soon moved to Pike Co. Ky., Kevin started playing guitar at the age of 7 and singing to crowds at local festivals. When his family moved to Ky., he started playing banjo for his own group, The Elkhorn Grass, which would last for over 10 years. This led him to full time employment at Dollywood after high school. After the Elkhorn Grass, Kevin worked in local bands around his home and kept up the local festivals. Working with Curly Ray Cline’s son, Timmy, was a step into the band of Jerry Williamson and Redwing, which he started playing banjo for and switched to mandolin. This led him to meeting James at a festival and his becoming a James King Band member. Adam Poindexter was born and raised in Roxboro, N.C. where all banjo players seem to come from (NC), Adam started playing at a pretty early age. Some of his friends may surprise you when you think of their names. Such names as Jim Mills, Lynnwood Lunsford and Steve Dillon all kinda grew up together playing close to one another at one point in time or another. Adam was also a good band leader before James with several regional groups such as Big Sandy and The New Classic Grass, which won the regional Pizza Hut Showdown at Denton. Adam Haynes born just outside of Norwalk, Ohio and raised in the Elyria, Ohio area. Adam discovered bluegrass music at an early age. His fiddle playing started at about age eleven playing along side his mom, dad and brother in a family band. They traveled and played festivals and shows for several years until at a festival where he met his Ky. Bride and married soon after. He later would move to Ky. And look for music as his full-time employment. Finally this would pay off by landing a job with the legendary Melvin Goins and Windy Mt. He would stay for a brief stint until approaching James for the job and starting in January 2002. Vocals are also a very important part of his performing as well. Randell Hubbert was born and raised in Southwest Va. near Richlands and now living in a town called Hoanaker. He has only been into the bluegrass music scene for just a little over 5 years, but it seems like it’s been in his blood forever. Music has always been around him since the time he first got interested. His dad plays and still gives him the encouragement to carry on. His approach to the bass and the timing of the instrument is superbly remarkable. See more at www.thejameskingband.com. 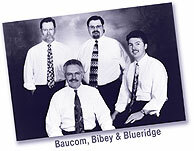 Baucom, Bibey & Blueridge – Formed in 1997 by two of bluegrass and acoustic music’s most celebrated performers Terry Baucom and Alan Bibey, BLUERIDGE seemed to be the perfect name considering all the members are from the foothills and mountains of North Carolina and Virginia. Their first project, “Common Ground” was released in 1998 and was ranked #3 in sales around the world. Their new project “Come Along With Me” was released on May 7, 2002 on the Sugar Hill Record label and has already reached #9 on the Bluegrass Unlimited chart along with songs at #2 and # 17 and a song on the Southern Gospel chart at #5 and all are still climbing! Already considered one of the super groups of this era, their boundaries are limitless. Terry Baucom is one of the hottest and most copied banjo players since Earl Scruggs. He supplies the powerful hard-driving banjo playing that is often imitated but never matched. He has played with such names as Charlie Moore, Ricky Skaggs & Boone Creek, and the original Doyle Lawson and Quicksilver, The original IIIrd Tyme Out and Terry Baucom, Lou Reid and Carolina. Already considered one of the living legends on banjo, not to be forgotten is his incredible bass voice, which has thrilled audiences all over the world. Also a sought after session player Terry has most recently made guest appearances on projects by some of the top names in bluegrass including Ronnie Bowman, Alan Bibey and Herschel Sizemore as well as playing on and writing the title cut for Knee Deep In Bluegrass: The AcuTab Sessions, which won “Instrumental Recording of the Year” at the 2001 IBMA awards show. He also is a sought after instructor having instructional books and videos distributed by AcuTab and Mel Bay. The Gibson company will have a Terry Baucom Signature series out available this fall cementing his staus as a true Bluegrass Legend! Since first hitting the scene in the early 1980’s, Alan Bibey has made a name for himself as one of the most creative and technically gifted mandolinist in bluegrass and acoustic music. He was a founding member of the New Quicksilver, IIIrd Tyme Out and Baucom, Bibey & BlueRidge. Alan also performed at the Carolina Opry country music variety show and appeared on many commercials and country music specials for the Family channel. In 1995, Alan was asked to be apart of a project called the Young Mando Monsters that featured the best mandolin players in bluegrass. He has also recorded with many different artist including Ronnie Bowman, Lou Reid and Carolina, Steve Huber and Herschel Sizemore. Alan’s first solo project “In The Blue Room” was released in May of 2000 to critical acclaim and was voted by County Sales as the #2 Instrumental Recording Of The Year. He has an instructional video and books distributed by AcuTab and Mel Bay and is also included in Mel Bay’s 2000 Mandolin “The greatest Mandolin Players of The 20th Century”. Alan also won awards for “Instrumental Recording of the Year” and “Recorded Event of the Year” at the 2001 International Bluegrass Music Award Show, and has been nominated numerous times for Mandolin Player of the Year. The Gibson Company will also be introducing a limited run of 50 Alan Bibey Signature mandolins available this fall reaffirming his status as one of the most influential mandolinist in bluegrass and acoustic music history! Junior Sisk has lived most of his thirty-something years in the Blue Ridge Mountains where he listened to and played the music that was born there. He has become widely known as one of the greatest voices in bluegrass today. In 1994, Junior met Wyatt Rice and soon after was asked to be a member of his band Santa Cruz. After two years and a very successful project with Wyatt, Junior struck out on his own and formed Rambler’s Choice. He and his band spent the next several years touring the US and Europe playing songs from their project ” Songs from the Mountains.” After folding the band Rambler’s Choice Junior enjoyed a short stint with the Lost and Found. He is now very excited about his latest endeavor with BLUERIDGE. Junior has also has made many guest appearances on other projects including Sammy Shelor’s project “Leading Roll” and Tim Austin’s ” Stanley Gospel Tradition: Songs About our Savior”. Junior has been nominated many times for Songwriter and Male Vocalist Of The Year. Junior also endorses BlueRidge guitars! Eddie Biggerstaff has played and recorded with some of the top bluegrass and acoustic performers in the world before joining BLUERIDGE including Larry Rice, Junior Sisk and Rambler’s Choice and Herschel Sizemore. He was asked to play bass at this years AcuTab concert which features most of the elite in bluegrass music today. Eddie is a seasoned professional who adds energy and a distinctive edge to the BLUERIDGE sound. Eddie’s high lead and tenor vocals as well as his rock solid bass playing are a driving force in the band. Sounds of Grass – Formed in 1972, and based in Charleston, South Carolina, Sounds of Grass have become very popular on the resort circuit where they have performed for U.S. senators and people from all over the world. Voted the best bluegrass band in the southeast at the Pizza-Hut regional competition in 1997 the “Sounds” (as they have been nicknamed) have performed at bluegrass festivals in Virginia, North and South Carolina, Georgia and Tennessee. At the National Cornbread Festival for Martha White Flour, they were both opening act and back-up band for Grand Ole Opry star Bill Anderson. Ernie Craft is largely responsible for the reformation of the current Sounds of Grass. An original member of the 1972 version he helped re-form this group in 1995. A powerful tenor singer and bass player, Ernie started playing in his Fathers band while still a youngster. Since that time he has traveled and performed up and down the east coast. Originally from Chattanooga, Tennessee, Gary Payne moved to Charleston, S.C. while in the U.S. Navy. A very talented banjo player who has his own sound company called G P Sound. Gary also handles all the booking and business for the Sounds of Grass, which keeps both him and the band very busy. While not playing the banjo or doing sound jobs Gary enjoys fishing, but only in the ocean. Multi-talented is the best description for David Smith. Prior to joining the “Sounds” he was playing banjo with a popular Bluegrass-Gospel band. When the guitar job came open in the Sounds of Grass everyone knew he would be the perfect pick. Great guitar player and wonderful singer David’s baritone harmony is second to none. Resonator guitar player and singer Rocky Springs has been with the “Sounds” since December of 1997. Prior to that time Rocky worked with various bands and also had his own bluegrass radio show on WKSY in Florence S.C. Growing-up in the Springs family music came very naturally. Rocky’s cousin Peanut is the mandolin player for the “Sounds” and both of Rocky’s children are very talented singers and musicians. Another original 1972 member of the Sounds of Grass, James “Peanut” Springs has gained the reputation as one of the finest mandolin players around. Performing on radio and TV. and on countless recordings for other artists his mandolin talent is no secret among bluegrass fans and musicians. Peanut is currently playing a F-5 model CORKY mandolin that he says is one of the best instruments he’s ever played.